Yesterday was Mad Hatter Day here in UK, and the Mad Hatter's tea party is the theme for the latest challenge over at Altered Alice. Unfortunately we never learn the rest of the words as he is interrupted by the dormouse. The sky has a starry look, created by using salt (one of the techniques on offer at Marit's Summer camp). Unfortunately it doesn't show too well in the pic. oh I LOVE !!!!!!! I LOVE MAD HATTER and I love your piece... W.O.W !! Yummy! We at The Altered Alice would like to thank you for bringing that delicious tea loaf to the party! 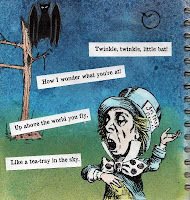 Love the Mad Hatter song you've illustrated here. A true cultural tragedy that the other verses are lost forever; I am certain they had deep significance and perhaps even the secret of life itself, LOL!!! I love the salt technique so I am imagining how fab that starry night sky must look in real life! Thanks again for being a regular player at The Altered Alice! The quote and Mad Hatter image you've chosen go so well together. Is the background of green and blue distress ink? I love the combo. 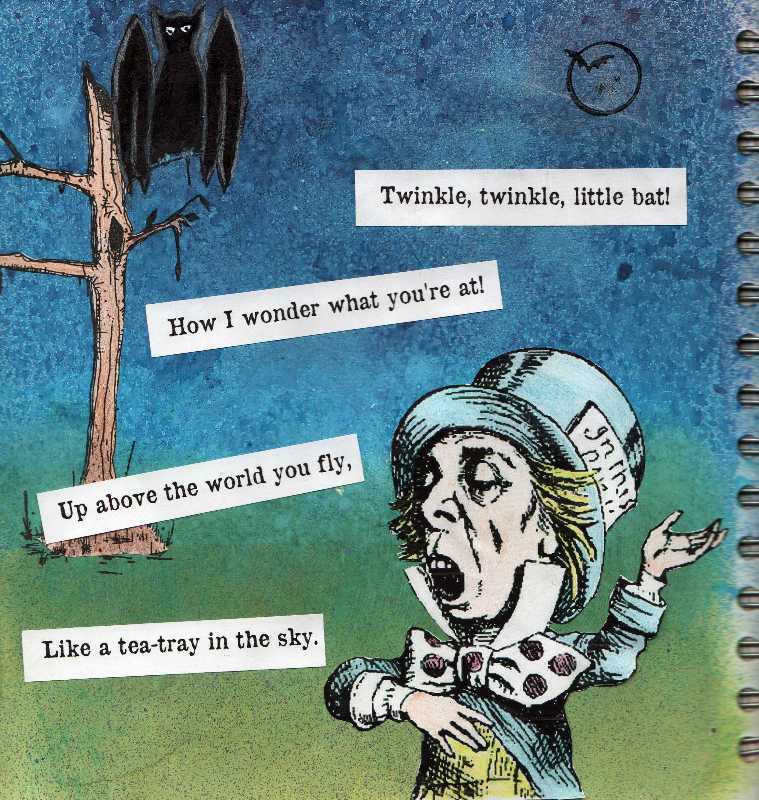 Thats a great piece of the hatter spouting off his favorite verse. He looks like he is truly enjoying himself. Thank you for attending the Mad Hatter Tea Party, Altered Alice Style. I hope you join us down the rabbit hole again next month. A fabulous piece Nigel. The loaves look so yummy, I'm off to have a slice or two now. I do wish I could see this page in real life, ánd have a slice of that bread. YUMMIE!! A pinch of salt for the sky: and one for the tea loaf? Yes? Not quite dark, they are visible really early these little bats. So you got the sky just right. Thanks for the comment you left in my blog. Just wanted to answer your question, the pages are held together using tissue tape, a fun and easy way to make an album out of anything! a nice way to celebrate Mad Hatter day! That bread looks delicious! My mouth is watering! Love your new creation, Nigel. Fabulous colors! Twinkle Twinkle Little Bat! AWESOME! One of my very favorite pointless poems! Your art, as always, is wonderful! Great colors and your forced perspective is stellar! Brilliant and those colors are really fab Nigel! Tea Loaf...looks and sounds VERY tasty indeed!!! Happiest of June weekends to you! Oh! Yummy tea loaf..not had that in a long time.. mmm..fabulous artwork..my first time visit to your blog!